Below you fill find all funeral homes and cemeteries in or near North Wilkesboro. Suburbs of North Wilkesboro: N Wilkesboro, Call, Cricket, Fairplains, Hunting Creek, Lowes Co Inc, Mulberry, Quarry, Spurgeon, Windy Gap. 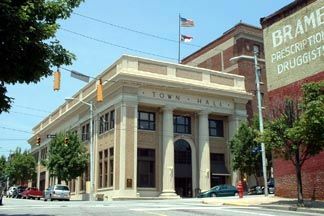 North Wilkesboro is also known as: Wilkes County / North Wilkesboro town. Their current mayor is Mayor Robert Johnson. Zip codes in the city: 28656, 28659.
e local funeral shops we partner with. Some of the notable people born here have been: Dean Combs (race car driver). North Wilkesboro is a town in Wilkes County, North Carolina, United States. The population was approximately 4,116 at the 2000 census and is now 4,245 as of the 2010 census. North Wilkesboro is the birthplace and original home of Lowe's Home Improvement, which continues to have a major presence in the community. The town is also known as one of the birthplaces of the sport of stock-car racing, and the North Wilkesboro Speedway was the first NASCAR-sanctioned track. North Wilkesboro's major industries include furniture, mirror, and textile production. Due to the town's proximity to the nearby Blue Ridge Mountains and the numerous tourist venues there, North Wilkesboro has been nicknamed the "Key to the Blue Ridge". It was written by Statesville Landmark on March 28th, 2019 that Ralph Olin Brooks died in North Wilkesboro, North Carolina. Brooks was 93 years old. Send flowers to express your sympathy and honor Ralph Olin's life. It was reported by The Star on March 1st, 2018 that Edward Donald "Ed" Roberts perished in North Wilkesboro, North Carolina. Roberts was 81 years old. Send flowers to express your sorrow and honor Edward Donald "Ed"'s life. It was noted by Statesville Landmark on February 11th, 2018 that Otha Leon Johnson perished in North Wilkesboro, North Carolina. Johnson was 80 years old. Send flowers to share your condolences and honor Otha Leon's life. It was revealed by Statesville Landmark on February 10th, 2018 that Geraldine Prevette (Lunsford) perished in North Wilkesboro, North Carolina. Ms. Prevette was 85 years old. Send flowers to express your sympathy and honor Geraldine's life. It was written on December 15th, 2017 that Dorothy Deal (Summers) died in Bristol, Tennessee. Ms. Deal was 90 years old and was born in North Wilkesboro, NC. Send flowers to share your condolences and honor Dorothy's life. It was noted by Statesville Landmark on October 12th, 2017 that Maude Ann Poteat (Lawrence) passed away in North Wilkesboro, North Carolina. Ms. Poteat was 97 years old. Send flowers to share your condolences and honor Maude Ann's life. It was revealed on August 24th, 2017 that John Arthur Dauer passed on in North Wilkesboro, North Carolina. Dauer was 84 years old and was born in Staten Island, NY. Send flowers to share your condolences and honor John Arthur's life. It was reported by Statesville Landmark on August 4th, 2017 that Marvin Douglas Johnson died in North Wilkesboro, North Carolina. Johnson was 54 years old and was born in Bronx, NY. Send flowers to share your condolences and honor Marvin Douglas's life. It was noted by Statesville Landmark on March 7th, 2017 that James Edward Padgett died in North Wilkesboro, North Carolina. Padgett was 63 years old and was born in Baltimore, MD. Send flowers to express your sorrow and honor James Edward's life. It was noted by Monterey Herald on January 10th, 2017 that Linda Louise Mondragon (Wood) passed on in Monterey, California. Ms. Mondragon was 87 years old and was born in North Wilkesboro, NC. Send flowers to express your sympathy and honor Linda Louise's life. On October 16, 1949 the Speedway held the 8th and final race of the 1949 NASCAR Strictly Stock Division; when the race was over Robert "Red" Byron had become the first NASCAR-sanctioned champion . The North Wilkesboro Speedway predates the founding of NASCAR; the speedway held its first race on May 18, 1947. North Wilkesboro is a town in Wilkes County, North Carolina County, North Carolina, United States. Lowe's Foods, one of the Southeast's largest supermarket chains, was started in North Wilkesboro in 1954. Lowe's Home Improvement Warehouse, the nation's second-largest chain of home-improvement stores, was started in North Wilkesboro in 1946. The official website for the city of North Wilkesboro is http://www.north-wilkesboro.com/. Grover Paris 'Geepy' Sykes Jr.
Elizabeth Bingham was a native of North Wilkesboro and the daughter ... and The University of North Carolina at Greensboro. Online condolences may be made at www.davidsonfuneralhome.net. Davidson Funeral Home is in charge of arrangements. W elcome to Miller Funeral Service. Locally owned and operated, Miller Funeral Service is dedicated to serving Wilkes and surrounding counties with compassion and dignity. Funerals in North Wilkesboro, NC on Yahoo! Local Get Ratings & Reviews on Funerals with Photos, Maps, Driving Directions and more. Find mausoleums & Mausoleums in North Wilkesboro, NC. Read business reviews, find driving directions, and more. mausoleums on YELLOWPAGES.COM. Listing all funeral homes in North Wilkesboro, North Carolina so you can easily send flowers to any location (same day delivery) or find any funeral service. Serving the North Wilkesboro area. Includes information about their merchandise, services, facilities and current obituaries. We work with local florists and flower shops to offer same day delivery. You will find budget sympathy flowers in North Wilkesboro here. Our funeral flowers are cheap in price but not in value.